Masterworks Museum of Bermuda Art and The Abolish Foundation will be hosting “Artistic Reflections of Historic Bermuda”, an evening of silent and live auctions on March 29 at the Masterworks Gallery. On display will be original art and limited edition reproductions from Graham Foster, Bruce Stuart, Magnus Musson, Lee Greene, Choy Aming, Jacquie Lohan, Lynn Morrell, Dockyard Glassworks, Dr. David Saul and others. 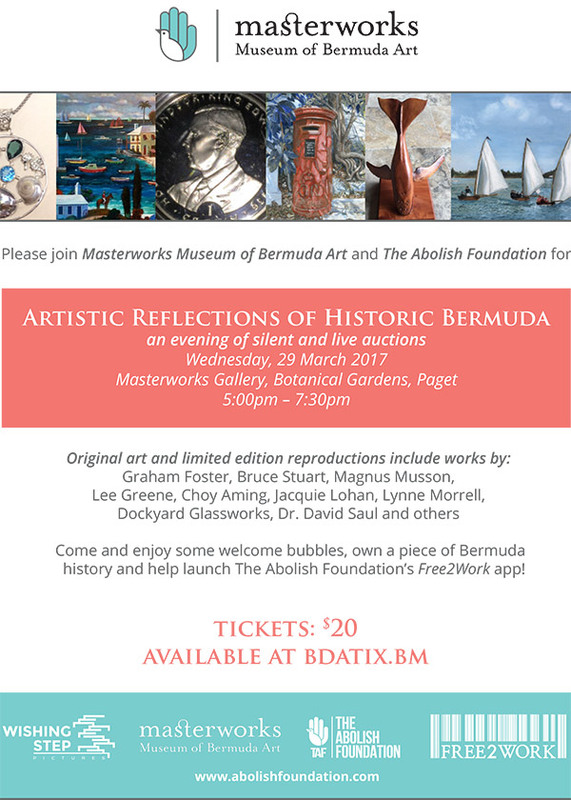 This evening gives everyone the opportunity to own a piece of Bermuda history, raise funds for Masterworks and help launch The Abolish Foundation’s Free2Work app. Tickets, $20, are available in advance at bdatix.bm.